The software targets Series60 Symbian9.x Mobile Phone devices, providing instant messaging of Class 0 or Class0 SMS (Flash SMS) facility over the GSM network. 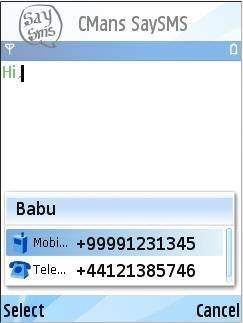 The SMS sent via this software will be directly displayed over the desktop screen in the remote mobiles than going into the Inbox. The software can be used in environments where the announcement information for immediate notice is required or to just crack a joke. 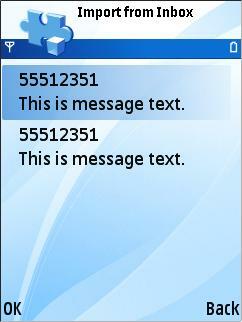 Once the message is read the background MTM system automatically deletes the message and won't be available in the Inbox.  From Options menu choose Send command, which by default opens the phonebook view listing the entries in phonebook to choose recipients.  Select the recipients from the phonebook entries if it is available. Now with v3.0.0 selection of multiple recipients to send simultaneously is allowed. Press OK. New menu is shown with the particular number to choose, if multiple phone numbers exits for same phonebook entry. Select one number for every recipient.  If the number of the recipient is not available in phonebook, press Back option. 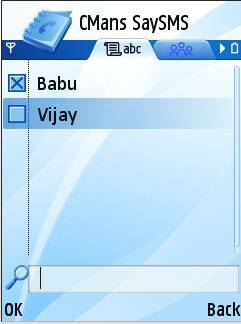 Now the window asking for manual entry of the phone number pops.  Enter the phone number manually and press OK.
 A Billability Statement saying that sending of SMS may be charged by the service provider. Press Ok so that message will be sent. 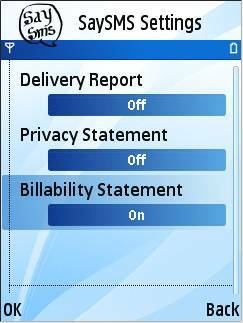 [The billability statement display can be disabled via settings]. SaySMS is usually used in the context of sending forward messages or cracking a simple joke. So this needs to copy messages from the inbox. V3.0.0 comes with a feature where we can import messages from inbox.  Open Options>Import from Inbox, select the available message from Inbox and press OK.
We can control functional behaviour of SaySMS by modifying the settings. 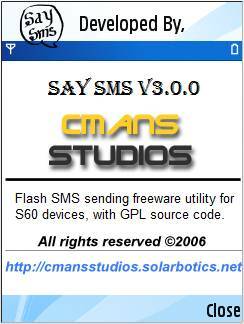 Developers can join SaySMS development directly with request for Sourceforge CVS access. If you are a innovative Graphic Designer, you have the oppurtunity to design the Logo. The best one among the received will be used along with the credits to the designer. 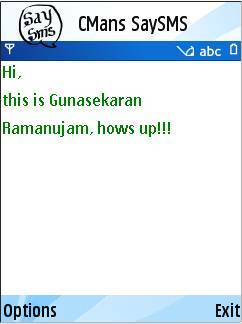 You can send by Contactus. Warning and Disclaimer: The software is provided ‘as is' without any warranty of any kind. CMans Studios is not responsible for any loss or damage to your Phone, SIM, or any data therein whilst using the software. It's just an add-on support. We don't assure you any guarantee if any damage caused on using the software. © Copyright 2006 CMansStudios. All Rights Reserved.